Simple models of functional or structural connectivity are insufficient to fully characterise the macroscale connectome. 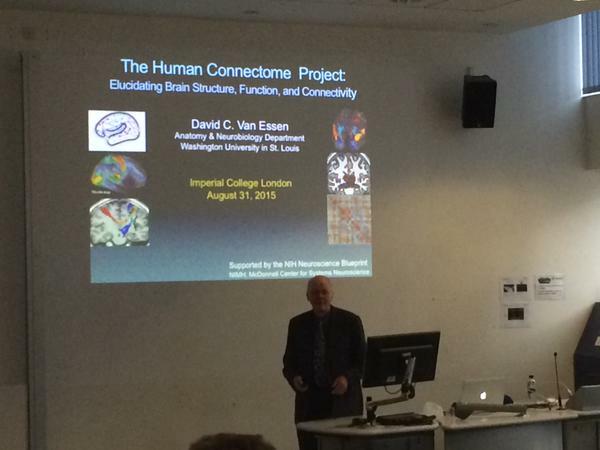 This was the overriding message conveyed from a series of talks organised at Imperial this week, starting with two excellent methods talks from FMRIB Oxford, and culminating in an inspiring overview of connectome research: past, present and future from Professor David Van Essen of Washington University and the Human Connectome Project. In their talks, Eugene Duff and Diego Viduarre showed that popular methods for estimating, and comparing, functional connectivity across populations limit the sensitivity of the approaches to detect relationships between brain connectivity and complex subject measures such as IQ or smoking prevalence. Currently, the most commonly used method for estimating functional connectomes is to simply estimate correlations between patterns of functional activity between two regions. This has multiple problems. First, simple correlation picks up both direct and indirect connections. This means that if connection A is physically connected to region B via region C, functional correlation will pick up the synchronised activity even though the connection is indirect. This can be corrected for using partial correlation. However, correlations also are affected by changes in noise or unshared signal, which makes it impossible to infer with any confidence if changes in correlation can be truly attributed to increases in signal synchronisation. Further correlations cannot be used to infer causality or signal directionality. Finally, functional connectomes estimated using correlation measures are positive definite covariance matrices. This limits classification and regression methods built upon euclidean distances measures. To overcome some of these issues Eugene Duff proposed examining how the variance of shared and unshared signal components varies under change of condition; showing examples from task fMRI. He found the way in which variance of activated regions was modified by being recruited into a task changed under different task conditions, demonstrating that signal variance could be having startlingly different contributions to different connections within any macroscale connectome. On a separate topic, Diego Viduarre showed evidence to support theory that functional connectomes lie on a Riemmanian space. He argued that classification and regression approaches should respect this mathematical foundation, if they are to be truly sensitive to detecting the connectional basis of behavioural metrics, or the effect of behaviour on the brain. One key message of the talk could be summarised as: “we’ve come a long way but we still have a long way to go.” In particular, Van Essen warned that despite achieving very high resolution diffusion tracking of structural connections the gyral bias caused by the preference of fiber tracks to project to the tip of a gyrus means that structural connectivity results should be interpreted with caution. Further, shape-based cortical alignment (alignment of cortical folds) has limited application since, although the generation of long distance cortical connections likely plays a significant role in the development of cortical folds, it is not the whole answer. Cortical folding varies significantly across subjects (including twin pairs) and the placement of functionally specialised sub-regions can vary considerably within a fold. Multi-modal analysis could help overcome these limitations. Van essen showed evidence that combined alignment of folds and resting state functional data can improve alignment of unrelated modalities such as task fMRI. Further, parcellation approaches that co-align and cross-reference features across data sets might lead to a more reliable correspondence with cytoarchitecture. Similar themes were carried through our symposium on Big Data Initiatives for Connectomics Research (http://biomedic.doc.ic.ac.uk/bih-symposium/), held at the Brain Informatics and Health Conference. Keynote speakers Saad Jbabdi (FMRIB, Oxford University) and Salma Mesmoudi (Complex Systems Institute, Paris) talked respectively about the possibility of inferring task activity from resting state functional imaging, and the generating an open-access web platform for multi-scale data integration and visualization of human brain data. 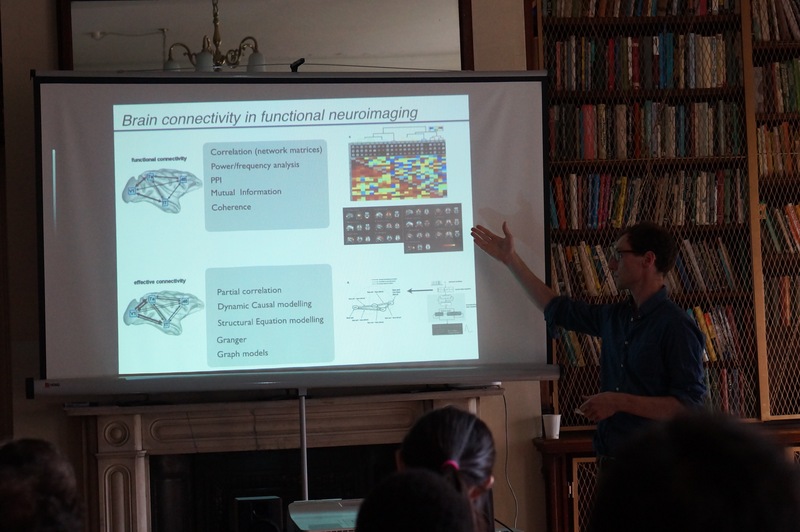 Other topics included inferring functional connectivity from structural (Fani Deligianni, UCL), comparing functional and diffusion imaging derived cortical surface parcellations (Salim Arslan, Imperial College) and comparison and classification for structural and functional connectivity networks (Ai Wern Chung, Kings College London and Sofia Ira Ktena, Imperial College London). Copies of the talks from each slide can be found here (http://biomedic.doc.ic.ac.uk/bih-symposium/pages/program.html). Previous Post Autism spectrum disorder: An Ethical dilemma facing connectomics research?